Unlike some of its 'Brit Bike' brethren, the Norton Commando Fastback 750 was a smooth and comfortable ride. This was due in no small part to Norton's 'isolastic' engine-mounting set-up - which dialled out the worst excesses of the parallel twin's 'vibes'. Norton had long prided itself on the good handling and road-holding of its products - and the Commando was no exception. In '73, Peter Williams took the bike to the toughest road test of all - an Isle of Man TT race! He departed the 'island' with the Formula 750 trophy. The Commando Fastback's performance on the road was almost as impressive. The 745cc motor put out a resounding 58bhp. With the bike weighing in at just 418lb, that equated to a top speed of 117mph. 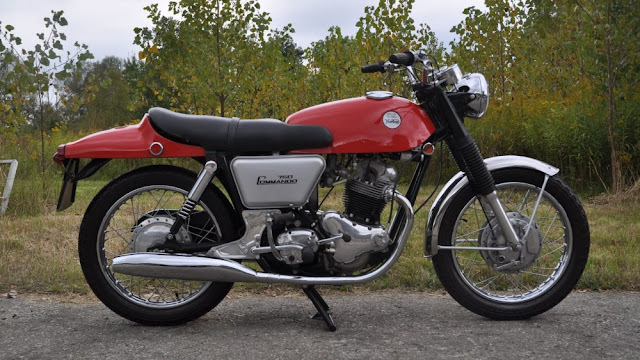 As was only to be expected from such a sound all-round package, the Commando sold well. Sadly, though, not well enough to save Norton from its financial date with destiny. But - for its uncommon blend of style and substance - the Norton Commando Fastback 750 will forever be revered by the classic bike community.